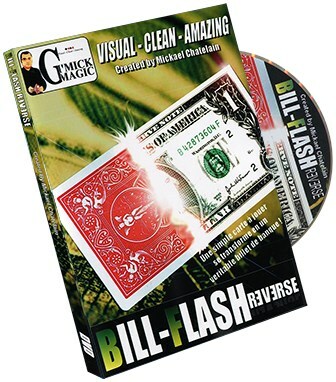 Mickael Chatelain's always produces innovative gimmicks and 'Bill Flash Reverse', like it's predecessor, will get your creative juices flowing as well as allowing you to perform a completely impossible illusion. A few years ago, Mickael put out an incredible effect under the name BILL FLASH CARD. REVERSE gimmick for the transformation of the card into a real banknote.